I woke on Wednesday to a more typical day in Beijing. It had been blue skies for my first few days, but starting the day before, pollution had settled in. Before the Olympics, the government spent $17 billion to clean up the air, but it’s horrible again – it’s so bad that you can taste it, it’s sort of metallic. I had an easier schedule, just two meetings and dinner, but they were important meetings. First, I met with Jipeng Wang, Founder and CEO of Cy-Fans. Cyworld is a site for celebrity fans that has a “SNS” (social networking service), clubs and an information service. Jipeng was super-cool in an Emporio Armani shirt, designer glasses, and smoking in his office (53% of Chinese men smoke). He was a blogger starting in ‘02 and started this after selling Blog China. This was my first, and only, interview that was 100% through the translator. The substance sums to, Cy-Fans looks just like a U.S.-based Internet company, except that the Founder/CEO is more of a king. The experience of conversing through a (non-simultaneous) translator, though, was really different. First, of course, it doubles the length of the conversation. That pace gives you much more time to think, which ends up mostly frustrating because I built up a backlog of questions, but is also good in that it focuses the conversation on more important points. It is also odd because there’s no natural flow to who’s asking and who’s answering. 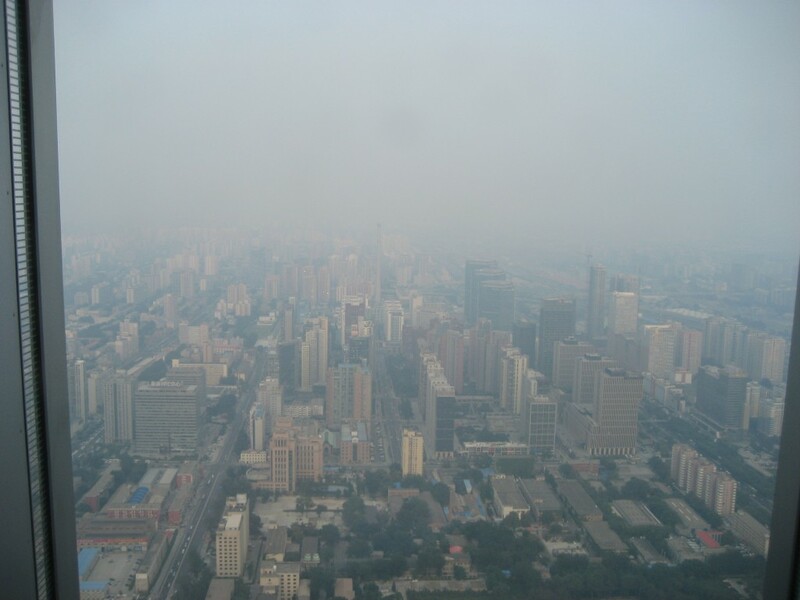 Beijing is huge – it has a population of 22 million and covers 6,500 square miles. Getting from one meeting to the next, mostly by taxi, was extraordinarily time consuming. Traffic can be terrible, and I often spent an hour or more getting from one place to the next. It is also surprising to me how often everyone gets lost. Not only are GPSs rare, the use of street addresses is too. A typical taxi ride included at least one discussion on a mobile phone between the driver and the person I was going to meet. I carried around a card from my hotel that had the name and address in Chinese as well as a little map, which was essential. Not even every address in Chinese would have fixed the overall problem though. Many days I didn’t need my interpreters for meetings, but I sure did need them to help me get to the meetings. Taxis are extraordinarily cheap. You can get very far on 20 yuan, or about $3. A really really long ride might cost $10. I took a long ride to get to Baidu to meet with the #2 guy, Haoyu Shen. Haoyu is another Chinese who spent years in the U.S. (in this case getting an MBA at Iowa, then, later, at American Express.) He manages everything related to revenue at Baidu, is essentially Founder Robin’s right hand. Baidu has over 70% of the search market in China, with Google at 24% and falling. Baidu has grown to look more and more Google-like over time, with better transparency for advertisers and clearer identification of sponsored listings. But, of course, Baidu is very highly censored. 15% of searches on Baidu have ads against them. Query length in China is 1/2 of the U.S. The most interesting part of the conversation at Baidu was about managing for innovation in China. Haoyu gave me an incredible example of the Chinese culture of copying (drop your cultural biases – it just isn’t seen as wrong here): a very successful social start-up, www.kaixin001.com had that odd url because they couldn’t afford to buy www.kaixin.com (kaixin means happiness). Once it was clear how fast they were growing, an investor group bought www.kaixin.com and launched an exact copy of www.kaixin001.com on that domain. Even the New York Times got confused (see the correction at the bottom of the article). For dinner we went to meet Carter Tseng, who brought along his good friend Joe Lee. With friends from Xerox Park, Carter Tseng co-founded Microtek International Inc., a scanner technology company that went public in 1988. He is s member of the Committee of 100 and is primarily a philanthropist now. 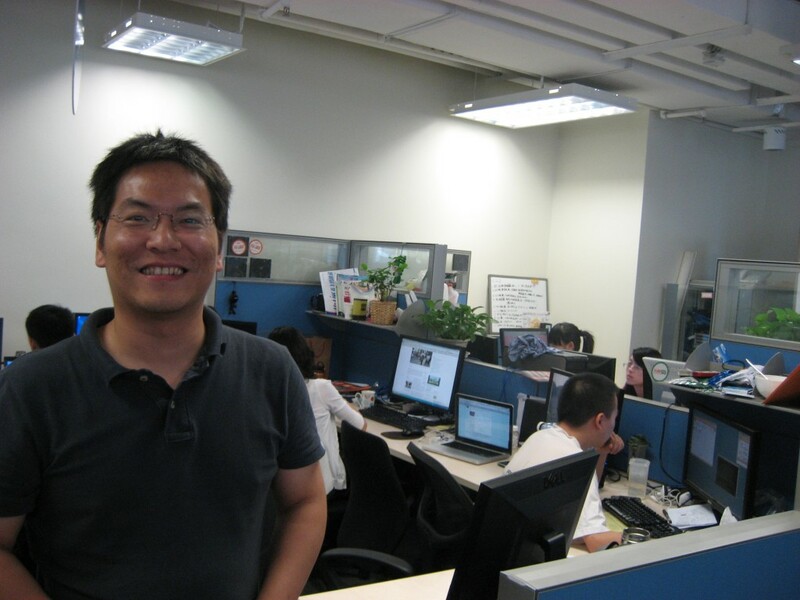 Joe Lee was National Technology Officer of Microsoft China, and spent 18 years at Bell Labs. Carter was an absolutely charming host, aided by his Taiwanese friend who runs the Japanese restaurant where we ate tons of delicious food in a traditional tatami room. His story is compelling and he’s active in a number of exciting projects today. Pirating has some huge consequences I hadn’t thought through – because there are no automated updates, network security is terrible in China and is holding back the shift to cloud computing. The mix of technology and services in China is and will be different, because there is such a large population that will continue to be uncomfortable online and because labor is so cheap. Joe confirmed that individual employees tend not to be very creative either. Chinese engineers are super-smart but re-solve simple problems in ways that are inferior to standard solutions and can’t make creative break-throughs to solve big problems. I got back to my hotel just in time for a ClickEquations Board call. Long days! My sleep improved a lot, I managed to stay up until about 11p and didn’t wake until after 5a. In the morning I went over to the mall near the hotel to buy a transformer, but it turned out that they didn’t have one. They did, however have wifi! It was great to get my email on my iPhone, even if I couldn’t reply. Then I took a taxi to the Forbidden City. The Forbidden City was built in the 1400s and was home to 24 Emperors, ending with the Last Emperor in 1912. It is enormous, with almost 1,000 rooms and housed almost 10,000 people. Today, it was mobbed with thousands of almost exclusively Chinese tourists. The Forbidden City definitely doesn’t show China at its best. The entire area was filthy – dirty and with trash everywhere. I had read in my guidebook that Chinese from the provinces might stare at me; not only did they stare, they also took photos. While making my way toward the very long ticket line, I was stopped constantly by people hawking things or wanting to act as a guide. I had no intention of buying anything or hiring anyone so I just kept walking. For some reason though, one guide cut through the clutter and I agreed to hire him for the equivalent of about $10. He skipped the line somehow and got me a ticket and off we went. It turned out that he was a Ph.D. student at Beijing University and had just given a dozen visiting professors from Boston University a tour. He was good, although I didn’t get much out of the city – the buildings are there, but there’s almost nothing in them. And the Southern parts have been restored without much sensitivity. At the end of the tour I was funneled into the high-end gift shop where the supposed nephew of the Last Emperor does calligraphy. I hate that stuff. Nonetheless, it was interesting to see and stand in the place where so much history happened. 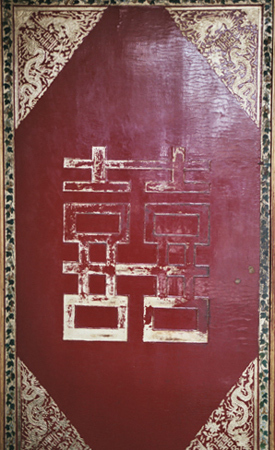 The only furnished room is the Emperor’s honeymoon suite, where he and his bride met, with the Double Happiness theme. 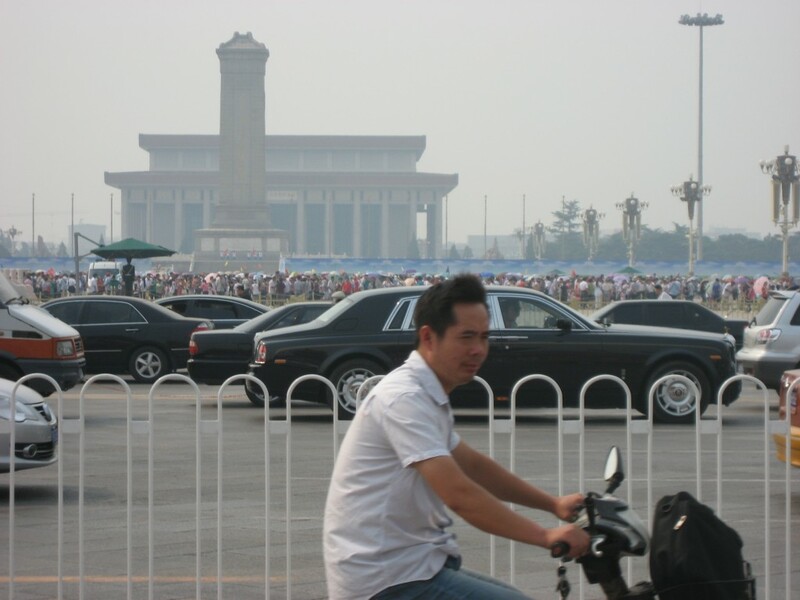 Across the avenue from the main entrance to the Forbidden City is Tiananmen Square – which is enormous. Again, there’s not much to see there. As someone said to me in Shanghai, the Chinese could teach Texans something about big. At the end of the tour, I met my new translator (Charles had a family commitment to attend to) met me at the North entrance. We walked forever until we were able to get a taxi – they’re not allowed to stop near the Forbidden City entrance to prevent traffic jams. I mentioned, as we were walking the third long block to where they’re permitted to stop, that there should be a taxi stand or special lane so that people could get taxis. She said, in a puzzled sort of way, that then there would be traffic jams. Looking inside her reaction, you can see a couple of the differences in the typical Chinese vs. American way of thinking. First, she sees the collective benefit of no traffic jam as outweighing the individual cost. Second, she assumes that the authorities have it right whereas I assume that I do. We did finally get a taxi and headed to a banquet lunch with people from CEAIE, the organization related to the Ministry of Education that is Eisenhower’s partner in China and responsible for my scheduling. These meals take place in private rooms around a big round table with a lazy susan overflowing with every kind of dish – just like in Chinese restaurants in the U.S. The food was very similar too. There is a very specific seating arrangement for these events, which is one of the formalities that are the ying to the more typical causal yang in Chinese manners. It wasn’t managed well this time, as my interpreter was seated far from me – I think that Charles would have asked to be seated next to me. The lunch was hosted by Jiang Bo, Secretary General of CEAIE, and attended by Fellows Liang Gui (Director General of the Ministry of Science & Technology’s Torch High-Tech Industry Development Center) and Feng Hongjuan (Research Fellow at the China Reinsurance Corporation). 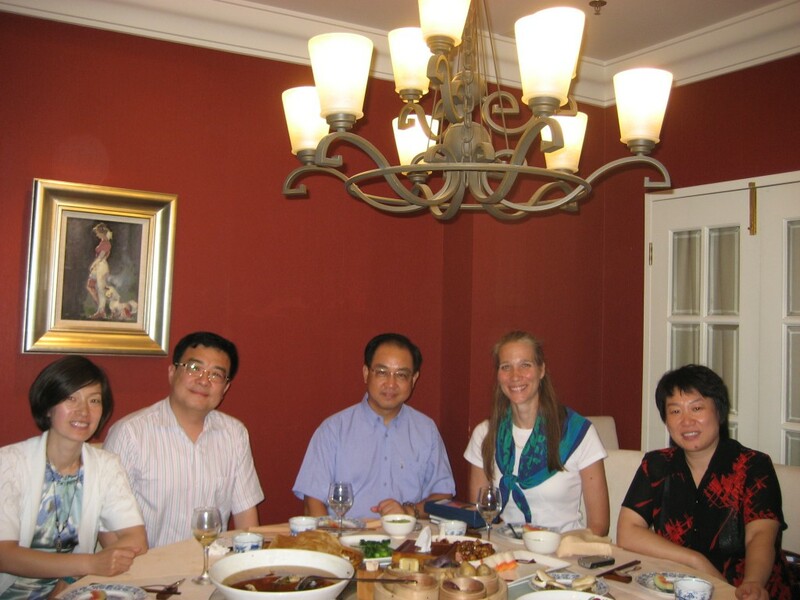 I was happy that 2010 China Fellow Li Hongwei, a professor of Marxism Theory at, CCPS, joined us too. Particularly because almost all of the conversation turned out to be in Chinese, and she was the one who would let me know every know and then what the topic was. Despite not understanding most of what happened, it was a very worthwhile as both Jiang and Liang made generous offers to use their networks for introductions for me when I return in November. After lunch, we took the subway to my first meeting of the day. It’s a great system, with about 7 lines, air conditioned stations and trains (except the first line). 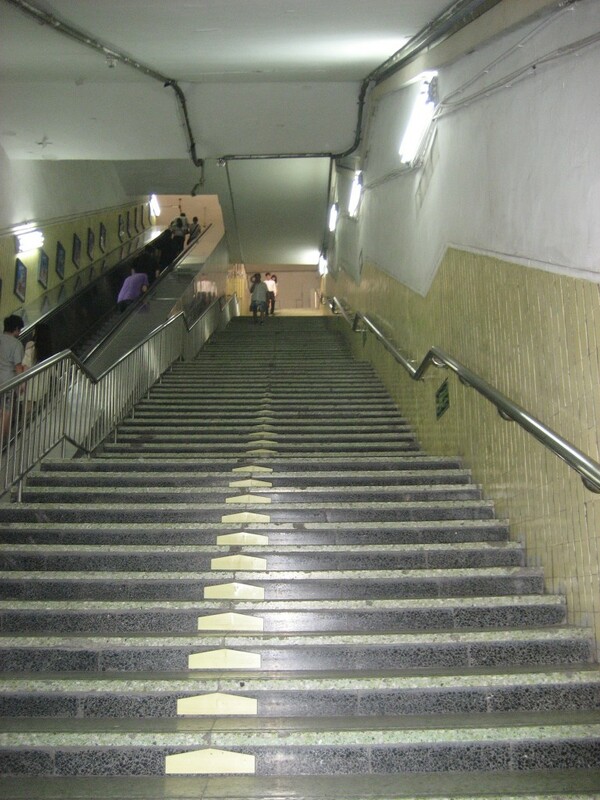 There are incredibly long stairs down to the stations. Ads are projected on the tunnel walls as the trains speed between stations. And there are video monitors in the train – this trip playing an infomercial for a nail clipper with a plastic case that catches the clippings. Really. I enjoyed riding the subway because in the middle of the day it’s filled with kids and their grandparents, both of whom seemed to enjoy me too. Vincent Gong is a Business Development Director at TripAdvisor. Before that he was at Hyatt for 10 years and was the online marketing manager for Howard Johnson (a 5-star chain here!). Vincent is absolutely charming, and this was a great rubber-meets-the-road meeting. Vincent knows the market inside and out and shared some interesting statistics. TripAdvisor is entering the China market the right way, giving local management complete leeway – even the site name is different here. This seems to be a critical element of a successful China strategy, since so much is different – not just the cultural elements, but the internet and payments infrastructure too. Next we met Nobert Chang, a serial entrepreneur. He’s an ethic Chinese who came here as an adult (I met a lot of these). He built a mobile gaming company that he sold to Sony, stayed on there for a while, and is now building another startup. He took us to a brand new hotel for coffee, on the 80th floor – nice place with an amazing view. After a confusion about which Hilton I was staying at (this was constant the entire week – my hotel was new and taxi drivers don’t know it yet), Australian Fellow Jason Yat-sen Li and his delightful wife Lucy picked me up for dinner. We went to a charming Hunan place in a a courtyard in old Beijing. It was cool enough The food was excellent, and not at all like the Hunan food I’ve had in the U.S.
I’ve been challenged here by a combination of power supply issues, extremely limited wifi availability, and blocking. My power issues are resolved, thankfully. There’s wifi in the mall down the street, which lets me receive but not send email. With power back, I have wired access in my hotel room again – phew! But you can’t – without proxies etc – access Facebook or Twitter from China. All to say, things are great and I hope to catch up with my blogging later today! My power problems and an insane schedule led to be getting behind in updating, but I’m finally starting to dig out today. Sunday night I didn’t sleep much. I was told to stay up until 10p the first night and made it to 9:45 before crashing. But I woke up at 2:45 like it was morning. I had breakfast at the hotel, they have absolutely amazing buffets here. And met my I met my translator, Charles Jiang. We took the first of what would be many taxis to meet Tomer Rothschild at a Starbucks (they’re everywhere in Beijing like they’re everywhere everywhere else). Tomer is a Wharton MBA who’s been in or around China and Taiwan since the ’90s. Among his experiences, he worked at Bally Total Fitness opening China. Bally’s joint venture with the China Sports Institute (part of the state, as is almost everything else here) was a very typical failure. A huge opportunity exists for new lifestyle products like wine, baby products, restaurants, spas, etc… People are looking for ways to spend their money. There’s a tidal wave of Chinese students going abroad to study, because the top schools admit less than 1% of applicants so there are extraordinary students who can’t get it, there is prestige in going abroad to school, and more progressive parents think the education is better outside of China. The government is critical here in a way it simply isn’t in the west. And it’s borders are wide and blurry. Best line, in reference to driving: “the hardware is great, the software is a mess.” Absolutely true, the Chinese are not the best drivers. I saw three accidents in my first 24 hours here. The we took a long taxi ride to the “Silicon Valley” of Beijing, where Google, Microsoft et al have office towers near Beijing University and Tsinghua University. Other than the lack of Indian and caucasian faces, and the vertical rather than horizontal buildings, it could be Palo Alto – it has the same feeling. We had lunch at a Chinese “fast food” place. The food could have been from the Chinese place in the strip mall at home (actually, it’s excellent). We’ll see how it stacks up to a Chinese feast – supposedly I’ll be having one of those tomorrow. Then we went to Innovation Works to see Chris Evdemon and the famous Kai-Fu Lee. Chris is a successful Greek entrepreneur and angel investor, who is now Investments & Business Development Manager at Innovation Works. He started an international computer skills testing company in Greece and sold it. Before coming to China he spent some time in Singapore. We spent most of our time talking about the early stage investment environment in China. Shanghai angels are more mature, Chris is President of a group there that is 10 years old. 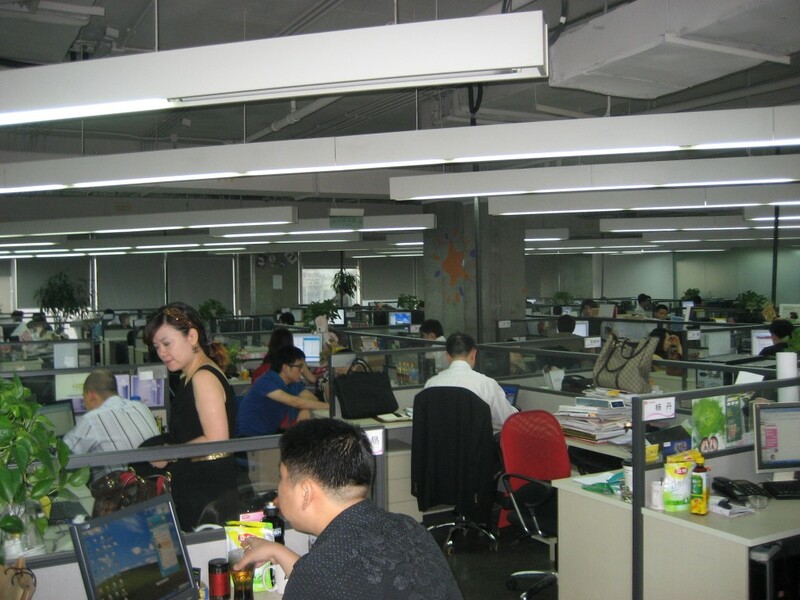 There are groups like the China Business Angel Network which has 60 members. There’s an interesting conundrum in that the very best seed opportunities are super-local and the angels can’t find them and they don’t know how to access the angels. After coffee with Chris I had over an hour with Kai-Fu. He was extraordinarily open and generous – I can understand why he is so beloved here. The Innovation Works business model started out somewhat like Idea Labs’ – they would identify opportunities and put team together around them. That didn’t work because entrepreneurs are too independent and didn’t graft to someone else’s idea. Today they are more like an incubator, taking very very early stage ideas and putting their resources around them. There are three key challenges that Innovation Works can help with: 1) Hiring engineers, which isn’t a challenge for them. Over 100,000 have sent in resumes to Innovation works. (Yes, 100,000 resumes. Welcome to China). 2) Figuring out the right business model 3) Making very senior level connections. There’s a mis-match between both young engineers’ and sea-turtles’ expectations and reality. They think they’re ready to be CEOs and few are. He thinks that the attributes of the stand-outs, who will make good entrepreneurs are initiative, self-awareness, and business sense. We then spent a while talking about Google. I’m going to do an entire post about the search environment and Google after I’ve met with more people. My final meeting on Monday was with Francis Goh, Search Director @Neo Ogilvy. It was great to get the rubber-meets-the-road perspective from Francis (and thanks to Barry Lloyd for the introduction!). 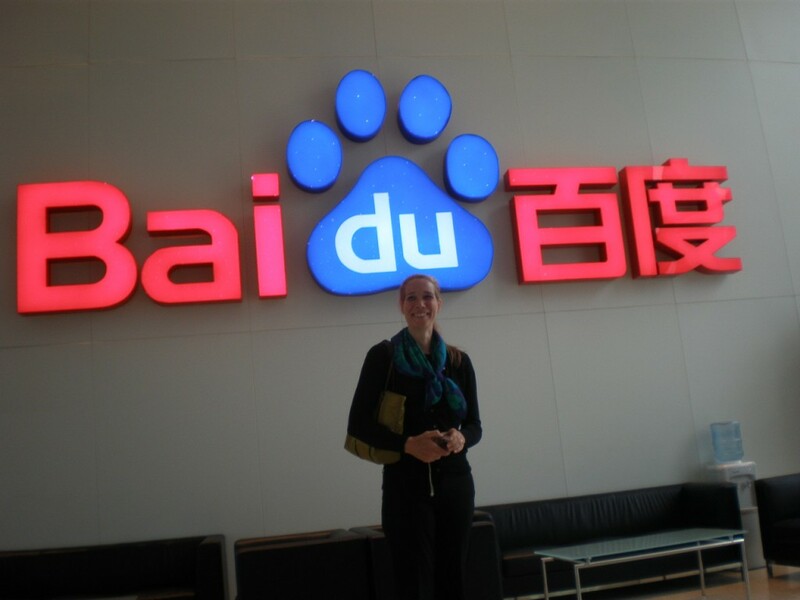 Francis explained a lot of how Baidu works, which will go in that separate post about search. It was a long, good first day. Finally, a few early observations about Beijing. It’s ugly. I love cities. Dirt, noise, crowds – none of that bothers me. 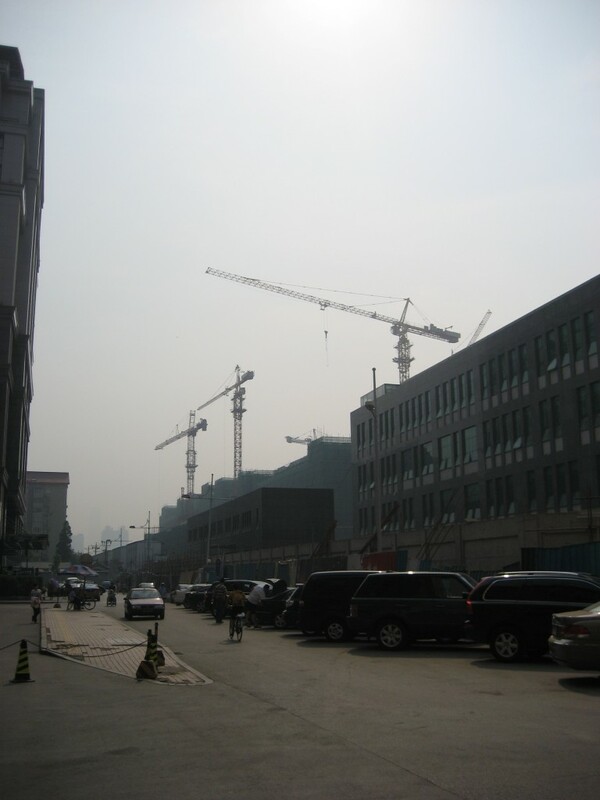 But there just isn’t much that’s aesthetically pleasing about Beijing. That’s a big surprise. It’s not nearly as hectic as I thought it would be. It is busy and there’s a mix of cars, bikes, and pedestrians that you wouldn’t see in the west, but it’s not frenzied. It is hot here right now. Horribly oppressively hot and humid. People are generally very casual. We landed in Beijing at about noon, a bit early. The airport is huge, soaring, spotless, and extremely well-designed. After a very short wait at customs I was whisked by a car from the hotel into the city. My initial impression was very different than what I expected. There are many bicycles but not nearly as many as I thought there would be. Traffic is a bit crazier than in Philadelphia but not much. (That said, making a left turn across traffic seems to be a game of chicken – between a crazy mix of taxis, bicycles tiny cars, and luxury cars. The main avenue leading to my hotel is lined with every one of the most expensive car dealerships: Rolls Royce, Mercedes, Aston Martin, Ferrari, etc and there are more Audis and BMWs on the street than in New York. It’s clear that there’s a lot of wealth here. I was lucky to be upgraded to a huge room. I was warned that it’s critical to stay up until 10 the first night or jet lag will kill you, so I resisted drowsiness (I only slept a couple of hours on the plane, unfortunately), unpacked, worked out, and got ready to go to my first meeting. There had been some email exchange about how to get to dinner, and I knew that I was to get a car which would wait for me at the restuarant, just because it was my first day, but I didn’t have my final itinerary and had no booking information. So I got one from the hotel. I met Jinwoo So and his assistant Tony Choi at an Italian restaurant, Tavolo. Mr. So is a 2006 Fellow and a runs a variety of business development groups at SK Telecom, including their Chinese market efforts. He is President, Growth & Innovation CIC, SK China and President, C&I Business, SK Telecom, China. We had a wide-ranging and very interesting conversation about the market, the business culture, the tremendous opportunity here, and the challenges. Mr. So is vey entrepreneurial, smart, knowledgeable, and charming (and speaks perfect English). His assistant Mr. Choi was also very impressive, young and with a very good understanding of the Chinese market, particularly for Internet companies. He’s been here for three years and is fluent in Chinese as well as English and his native Korean. There is an amazing growth of wealth here. It is what we’d think of in the U.S. as “new money” and it is driving luxury consumerism at an amazing pace. The prices of luxury cars here are double what the are elsewhere. There isn’t yet a maturity in the consumption, it is not value-based. The Chinese culture is capitalist at the core, which is not the same thing at all as being democratic. All that’s happened in recent decades is that the capitalist tendencies have been unleashed. Working with and through government here is critical. It is easier often to do that at the local level, where economic development is the priority and the question of Chinese or foreign companies driving that development is less important. Regardless of where you’re doing business, it’s all about the relationship. Mr. Choi made the interesting observation that one reason for this is that the country is so big – unless an individual is enmeshed in a spider’s web of relationships, it’s just too easy to do something bad then head off to another province where no one knows you. It is incredibly difficult for non-Chinese companies to succeed in China. Note that Skype is alone among large internet players succeeding here. The recent announcement that Xinhua and China Mobile are joining forces to create a mobile search company. There seems to be a winning formula in the internet space here: a founding team that is a mix of people who are here and steeped in the local culture and business community with hai gai (or sea turtles – Chinese who have studied and/or worked abroad and are now coming back). Finally, it was fun to witness a bit of Korean etiquette while here. I got half of the business card exchange right: hold the card with two hands, present it carefully. But forgot with the first one that I should study it carefully for some time and make a comment of some sort about it. Mr. Choi took care of all of the logistics for diner, from the reservation before to summoning the server and paying. I am looking forward to meeting Mr. Wang, CEO of Cy-Fan. Mr. So made that introduction for me and appreciate the help tremendously. I’m blogging this at 3 a.m., unfortunately, after only 5 hours of sleep. I generally sleep about 6 hours but I’m worried that i’ll collapse by the end of the day. I have four meetings, including dinner. A note on technology logistics – I have connectivity via a short ethernet cord, there’s no wifi in the room. Happily it was easy to share my connection with my iPad so I can surf and email from bed. And Skype works perfectly. Finally, I don’t think I’ll be doing such long posts from here on. I’ll be trying to do brief summaries of each meeting. It’s not often any more that i get to do something major that i haven’t done before. Beyond the great business meetings and connections that my Fellowship is providing, there are core experiences that I’m hoping will stretch me. Others should just be fun. In the plane, flying First Class, so far, was different. Lots of Chinese flight attendants, mostly Chinese travelers, announcements in Chinese. You’re given a cool little case with toothpaste, socks etc. The seats go completely horizontal and have a canopy to keep out the light. Dinner is 5 courses. Old hat for many, I know, but it’s all cool to me. On the more substantive side, I’ve never traveled so long so far by myself. Or been away from my girls for more than a week. Been in a place where I can’t read a thing. All taken together, I hope to get outside my comfort zone. It’s been a whirlwind at work and I haven’t had adequate time to really sink into the reality that I’m off to China today. But, nonetheless, here I go. Got picked up at the house and driven to EWR by a driver, Tony Vendetta, who does all of Eisenhower’s driving. Great guy, even better name, and a very nice way to do it. I got an upgrade to Business Class, so checkin was a breeze, and my colleague Adam gave me a card for the President’s Club (thanks! ), so I’m hanging out in style with wifi and power to write this, my first trip post. A rush of activity over the last week got me to this point. My schedule looks great. I start with a dinner tonight, and I have 3-4 meetings a day in Beijing. I do have one morning to visit the Forbidden City, but otherwise it’s packed. Then I’ll fly to Lhasa on Saturday and tour Tibet. The NYT conveniently had an interesting article on TIbet this week - China Seizes on a Dark Chapter for Tibet. I fly to Shanghai on Tuesday for another (less-packed) three days of meetings. I’ll add to the 40 million visitors to the World Expo while I’m in Shanghai; reports are that it’s absolutely amazing. Then home on the 28th. My plan is to blog daily with summaries of my meetings. I have no idea if that’s a realistic goal. My schedule is probably 80% filled. I got lots of advice to leave a lot of open time for ad hoc meetings and just to relax, but every next meeting that came up was too good to pass up. I had been warned that I could end up with too many Government and Academic meetings, but I think I may have ended up with too few! Happily I can address any imbalance when I go back in November. About 10 days ago we found out that my coordinator in China, Ms. Liu Yibo was going to be in Taiwan while I was in China and so she was replaced by Ms. Claire Zhang. I was concerned initially, but Ms. Zhang jumped right in with perfect and proactive follow-up and communication. I will have an interpreter, Charles Jiang, who works with Eisenhower a lot, with me for most of the trip. And a driver, Bai Gang when necessary. One of the key elements of courtesy that is different in China is the exchange of gifts. Frequently, I’m told, people I meet with will present me with a small gift – a tin of tea or a paperweight for example. When they do, I need to reciprocate. I got nice pens because they were relatively light and small and affordable. I was up to date on the vaccinations I needed. I got a first aid kit list from a friend who travels to China often, and picked just a few things from it to bring. Everyone tells me to stay 100% clear of the water, even for teeth brushing. Finally, a staple topic of every Fellow conversation: packing. Everyone says to pack light, so I did. I have a suit, a jacket, a skirt, a pair of dress slacks, a bunch of blouses, and two black shoes (one of which are sandals – it’s going to be hot there!). Plus jeans and t-shirts. And I’m wearing sneakers and a jacket (for Tibet). That plus my Yoga mat and a crazy array of electronics and protein bars fit in my standard roll-aboard. I hope I have enough stuff. It’s sure nice not to have to check any luggage. I’ll buy a bag in China to check on the way home with whatever I pick up while I’m there. Setting up cost-effective communications between the U.S. and China isn’t simple. Skype certainly is – you can’t beat free – and I intend to use Skype (on my iPhone, iPad, and MacBook Pro) over wifi as much possible. I’m staying in business class hotels, so I should have reliable wifi. Together, these will let me talk with people on their phones in the U.S. very cost-effectively. But they still require me to be on Skype. To bridge to a phone in China, I have a China mobile phone – thanks to a friend who travels there frequently – for which I’ll buy a SIM when I arrive. Rates seem to be in the $20 for 1-2 hours of talk. I’m pairing that with a calling card (yes, cheeziest site ever, but she says they’re for real) at $.032/minute after the caller enters a jillion numbers. The last element is a separate China mobile that Eisenhower provides that is exclusively for local calls about scheduling and logistics. Yes, that totals three phones. Not addressed yet in this solution is text. I bought $5 credit on Skype for SMS, but messages cost $.09 each! I think that I’ll get text on my China mobile, but I won’t know until I’m there. 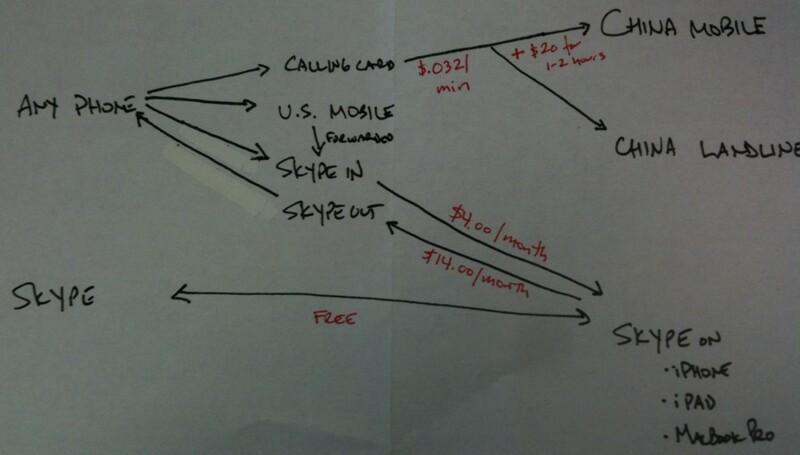 The goal of all of this was to have a call from the U.S. to my U.S. mobile reach me in China cost-effectively. It doesn’t seem that that’s possible today. But my Rube Goldberg solution should get me most of the way there. I just have to remember to forward my iPhone and put it in Airplane mode (with wifi on) for the duration of my trip when I board the flight on Saturday. Two weeks until I arrive in Beijing. At this point I have 10 confirmed meetings, almost all through my own networking. All of that has been very smooth, except for the confusion regarding two different Zhang Tao’s – one at Baidu and the other at Dianping.com. There are 10 more of those meeting in process, and the Eisenhower network is just starting to kick in. I’ve gotten a lot of messages back from people that a month is way too long ahead in China. I’ve also had conversations with more people here who have worked in China, including Bill Doran from Morgan Lewis and Ron Drozd from the World Trade Center of Philadelphia, and venture capitalist David Williams. I and have continued to hear a consistent refrain: there’s tons of opportunity in China – for the Chinese. The challenges around intellectual property are well-known. I have been surprised to hear, though, things like how difficult it is to collect payment and how transient relationships with U.S. partners can be. I’ve had warnings to, in effect, keep my hand on my wallet. Chinese will all be happy to meet with me, I am told, with a single goal: to learn everything they can about how we do things. I’ll be very interested to see for myself.